Positron emission tomography (PET) and magnetic resonance imaging (MRI) have been used at adenosine stress and at rest to quantitate the regional myocardial perfusion reserve (MPR) [1, 2]. While dynamic PET is regarded as the 'gold standard' for the accurate non-invasive quantitation of regional myocardial blood flow, MRI is more widely available, offers higher resolution, and does not expose the patient to ionizing radiation. However, dynamic MRI perfusion studies have varied widely in their estimates of myocardial blood flow, often depending on what analysis method or system model is used in the study [3–5]. Here we compare stress and resting blood flow estimates from 3 T MRI and 13N-ammonia PET. For the MRI studies, blood flow estimates were computed by a fully model-independent image analysis method. Dynamic perfusion images in three short-axis (SA) slices of the left ventricle (LV) were imaged in five normal subjects with a Siemens Trio 3 T MRI scanner using an ECG-gated TurboFLASH pulse sequence. Typical imaging parameters were: TI = 100 ms, TR = 2 ms, TE = 1 ms, flip angle = 12°, 8 mm slice thickness. During rest and adenosine (140 μg/kg/min) stress imaging, a bolus injection of Gd-BOPTA (0.017 ± 0.005 mmol/kg) was administered (one subject was given 0.025 mmol/kg Gd-DTPA). On a separate day, PET imaging was performed with a GE Advance PET scanner. During rest and adenosine (140 μg/kg/min) stress imaging, each subject was given a ~20 mCi injection of 13N-ammonia over 30 seconds and images were acquired dynamically . The MR images were manually registered and the LV myocardium was segmented for perfusion analysis. Blood flow estimates in each LV slice were computed by model-independent constrained deconvolution of the blood and tissue enhancement curves. The model-independent framework uses iterative minimization to estimate the system impulse response function, h(t); the max of h(t) is directly related to blood flow. This method balances the accuracy of the estimated curve fits with a temporal smoothness constraint imposed on h(t), while not requiring the parameterization of h(t) with B-splines  or other polynomials. Also, this model does not require any assumptions about the compartmental structure of the myocardium. PET images were reconstructed using a filtered back-projection algorithm and three LV slices were selected to match those from the MRI studies. The resulting blood and tissue enhancement curves were fit to a 3-compartment model to estimate blood flow. Figure 1 shows three SA images of the LV at one time frame during a dynamic perfusion scan using 3 T MRI. Figure 2 shows the corresponding images from the same subject using PET. Figure 3 shows a scatter plot of the mean rest and stress flows from 3 T MRI and PET for three SA slices of the LV in all five subjects in the study. 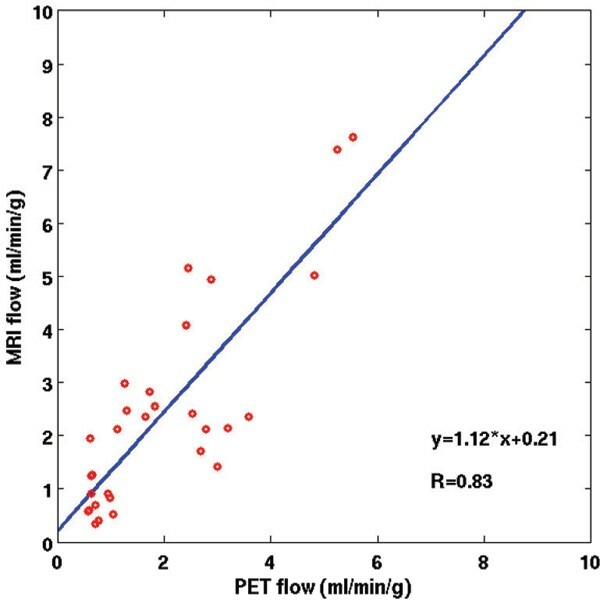 The best-fit linear regression between 3 T MRI and PET flows was y = 1.12x + .21 (r = 0.83). At rest and stress, the blood flow estimates for all the LV slices using 3 T MRI were 1.18 ± 0.82 ml/g/min and 3.61 ± 2.0 ml/g/min, respectively. The corresponding blood flow estimates at rest and stress using PET were 0.83 ± 0.25 ml/g/min and 3.08 ± 1.22 ml/g/min. The mean MPR for 3 T MRI and PET were 3.54 ± 1.43 and 3.68 ± 0.76, respectively. Three short axis images of the LV at one time frame during a dynamic myocardial perfusion scan using 3 T MRI. Three short axis images of the LV at one time frame during a dynamic myocardial perfusion scan using 13N-ammonia PET. A scatter plot of the rest and stress flow values using 3 T MRI and 13N-ammonia PET. The equation of the linear fit is y = 1.12x + .21 (r = 0.83). A model-independent deconvolution analysis method that uses iterative minimization and a temporal smoothness constraint was used to compute blood flow estimates from 3 T MR images. Myocardial blood flow measured using dynamic 13N-Ammonia PET gave similar results. Preliminary results reveal a good correlation between estimates of myocardial blood flow using 3 T MRI and dynamic 13N-ammonia PET. While the MPR estimates were very similar, the MRI model-independent method resulted in higher rest and stress flows with larger standard deviations than with PET. This may be due in part to the low doses of Gd used and inter-slice variability of the MR images. Additional patient and simulation studies are in progress to further evaluate the accuracy of this method in normal subjects and diseased patients.